Outfitted with 1/4 in. NPT male ends, the TEKTON 6 ft. x 3/8 in. I.D. 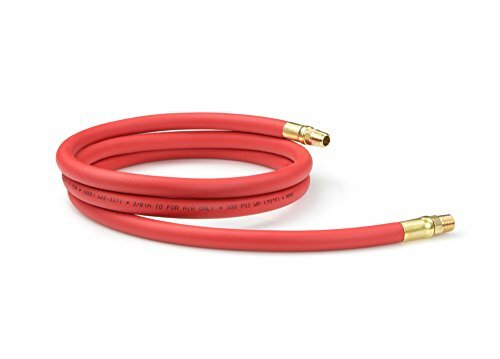 Hybrid Lead-In Air Hose is ideal for connecting supply lines, hose reels, compressors, and other system components. Even in the cold, its flexibility prevents vibrations from moving parts from traveling through the system and loosening connections or causing leaks. Solid brass end connectors never corrode and seal better against leaking than aluminum, steel, or zinc. CALIFORNIA WARNING: This product contains chemicals, including lead, known to the State of California to cause cancer, birth defects or other reproductive harm. Please wash your hands after use. If you have any questions about this product by TEKTON, contact us by completing and submitting the form below. If you are looking for a specif part number, please include it with your message.